For years Hessam Abrishami’s dynamic compositions, powerful expressions, and vibrant colors have captured viewers around the world with their amazing depth and unique intrigue. He has exhibited the ability to fascinate and disarm an audience with his artistic works. Hessam’s amazing imageries have been lifted off the canvas and portrayed in a three dimensional form through his stunning sculptures. This expansion has added a new dimension to Hessam’s growing artistic repertoire. By the age of fifteen Hessam’s love and obsession with art became evident while still in high school. His art teacher, who encouraged Hessam to pursue a higher education, nurtured his natural talents and endless inspiration for painting. 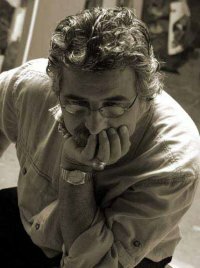 In 1975, Hessam moved to Perugia, Italy, to complete his Master of Fine Art Degree at the Accademia Di Belle Arti, “Pietro Vanucci”. The bright colors of Italy and the contrast of a quiet and relaxed artistic atmosphere greatly influenced Hessam and his works. Hessam has provided the world with images that capture an essence of love and romance. Hessam now reveals a more three dimensional representation of his paintings in his life like bronze sculptures.